Product Details: Our moisturizing facial wash, a perfect blend of beneficial ingredients and vitamin goodness, leaves your skin thoroughly cleansed and nourished. Perfect especially for sensitive skin. Our philosophy is: simple says-never use perfumes, dyes or harsh irritants that can upset your skin. Simple says-settle for only ingredients that meet simple's purity standard. 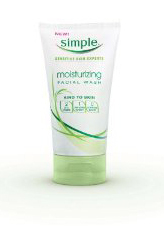 Simple says-trust the natural goodness in all of our products especially for sensitive. Skin simple says-natural beauty comes from goodness. Directions: Wet face with warm water. Squeeze a small amount into hands and work into a lather. Massage gently in a circular motion onto wet skin. Rinse with warm water and pat dry. Avoid delicate eye area. Ingredients: Water (Aqua, Eau), Sodium Laureth Sulfate, Decyl Glucoside, Cocamidopropyl Betaine, PEG-55 Propylene Glycol Oleate, Propylene Glycol, Panthenol, Tocopheryl Acetate, Bisabolol, Anthemis Nobilis Flower Oil, Pelargonium Graveolens Oil, Glycol Distearate, Sodium Hydroxymethylglycinate, Polyquaternium-39, Laureth-10, Cocamide MEA, Sodium Chloride, PEG-7 Glyceryl Cocoate, Disodium EDTA, Dipropylene Glycol, Methylparaben. I guess it's probably the result of my gene pool but I'm cursed with frustratingly sensitive, reactive skin. Even the one cleanser I've found that is alright for my skin isn't great. I recently decided to start looking for a better alternative in hopes of finally having happy skin. Simple's claims sounded good so I thought I'd give it a try. The first two days that I used it my skin was so painfully parched and flaky I almost gave up. But I figured since it was new to my skin I would give it a month before I tossed it. Maybe I just needed to get used to it. I spent the next three weeks suffering from the worst acne breakout I have had in months! Break-through breakouts are not uncommon when switching cleansers but it just got worse and worse. To make it more awful my skin was so flaky and dried out. But since my husband was also using it and had initially said he liked it I left it for him to keep using. A week later he was having the same miserable breakout symptoms I had been having. Needless to say we've gone back to our old product and will not be using Simple Moisturizing Facial Wash. I believe that one of the main reasons we both had this much trouble is that the second ingredient is Sodium Laureth Sulfate. Having recently read an article about this chemical--and industrial degreaser used in many soaps, shampoos, toothpaste, laundry detergent, and other products for cleaning because it's cheap--I think it's probably part of the problem. I think it might be time to remove it completely from our home but first of all not using it on our sensitive skin! While I hated this product, I did also try Simple Cleansing Facial Wipes which I have had no adverse reaction to. They're soft, big enough for the whole face and neck, and nice for those times you need to clean up in a hurry. I definitely liked them better than the face wash.
Notes: Product received for review via Amazon Vine program, for my honest review.